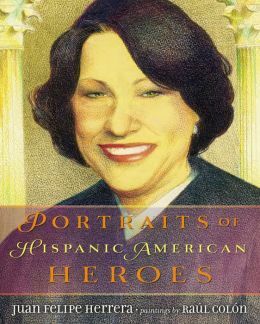 Twenty-One famous American heroes with Hispanic heritage are included in this beautiful biography collection. It is written by the Mexican-American Poet Laureate of California, who is himself the son of migrant workers. The stunning portraits are paintings done by Raul Colon. Each two – four page biography is skillfully written to include the education, dreams, goals, and quotes of those included. The heroes include those from sports, music, art, sciences, and politics. They span the past, as well as the present of American experience. Some of the biographies include: Roberto Clemente, Cesar Chavez, Desi Arnaz, Joan Baez, Ellen Ochoa and Sonia Sotomayor. This volume will be a useful research tool in schools and libraries, but is also a pleasant straight-through read for any students interested in biographies. Literacy skills such as nonfiction reading, research skills, biographies, as well as the sciences and careers. Students can also use this as a starting point for studying about any one of these important people as there is a thorough source list as well as a related reading resource page in the back. This is an important addition to broadening a library collection to include books about the diversity of the United States.